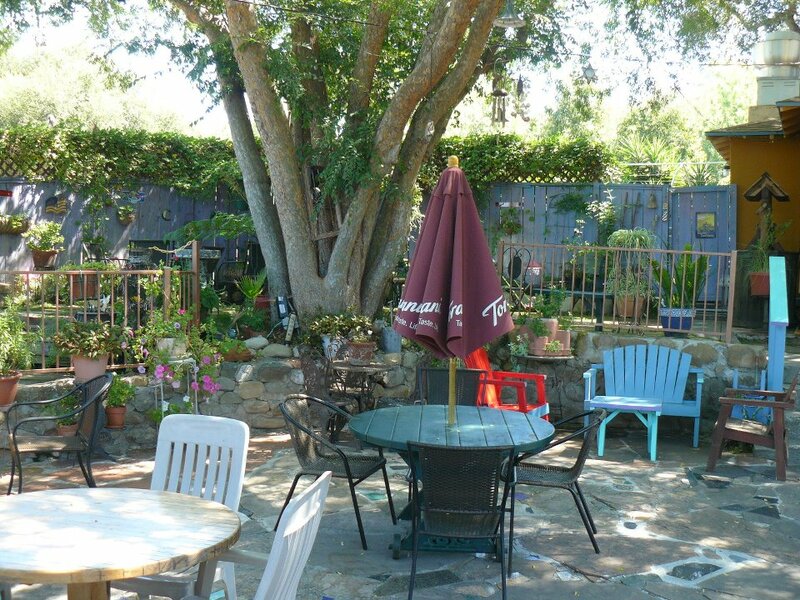 I’m sitting today in the gentle grace of the Full of Beans coffee house in Ojai California. We’ve barely flipped the calendar from January to February, yet I can unwind on the patio beneath the sheltering branches of a Chinese Elm, soak in an abundance of sunlight and relax into my relatively new life. I try not to feel guilty knowing that friends and family are winter bound in the upper regions of Oregon, Vermont and New York. There is something wonderful and terrifying about having this blank canvas on which to paint my life. Pulling away from forty years of northern existence has allowed the luxury of leaving decades of history behind, and the way one becomes solidified in the minds of others. For example, no one here knows me as the single mom on welfare, crazy enough to think she could make a living in the performing arts. And nobody is saying, “Hey, I remember when you taught at Portland Community College and went out with that guy that was so wrong for you. What was his name?” Or “Oh my God, remember that cross country trip in the hippie van with all the street musicians, and Big Bush, whose Afro took up the front seat? And what was the name of that guy who did acid about 400 times?” Ah, the wildness of youth wiped clean. Regret nothing that once made you smile! The downside is the limited way my eyes engage with those around me. When there are years of friendship, a light of recognition passes in a twinkle, landing someplace deep inside. But when there’s no history, you’re just another face. Eyes don’t invite in the same way, they only meet you on the surface, pulling quickly away. No cataloging of memory to be computed and filed, smiled about or declined. My work has changed form here as well. It flows easily or perhaps it’s the openness of those who live in the sun who are easy. When I lived in Oregon my window faced a forest of old growth trees. Several were damaged by storms forcing them to grow to the side instead of straight up. They were vulnerable but strong as their trunks grew in bizarre shapes, pushing through tangles of neighboring trees until they found enough light to reach for the sky. I often thought how similar our human experience is and how resilient our spirits. When we can’t grow in one direction, when we are thwarted, we reach for another. We don’t think about it, we just reach because survival depends on it. It’s the hand we’ve been dealt, the environment we’re born into, our inherent gifts and the limitations we’ve come to grow beyond. I did seriously wonder if a healer could make a living in a sun-filled place, without the advantage of the Oregon rainforest making everyone depressed. But it seems I can. I lean into my wooden chair painted in primary shades of playful, listen to wind chimes dancing in an easy breeze and smile as a neighbor’s boxer-lab mix pulls against his leash hoping for a taste of my croissant. So very happy for you, Sunshine Goddess!